They're Marvel's smallest heroes, but they're no shrinking violets - unless you want to color them that way, that is! They're Ant-Man and the Wasp - and it's your job to put the life into their microscopic world! 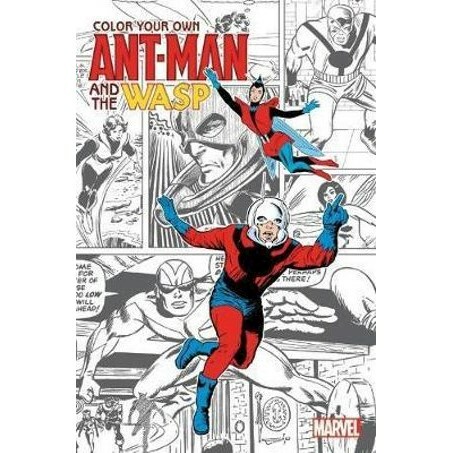 Get experimental with scientist Hank Pym, the first Ant-Man - and maybe one or two of his other alter egos, like Giant-Man or Goliath! Dig deep into your collection of pens, pencils or crayons to do justice to Janet Van Dyne's extensive wardrobe of Wasp costumes! And who better to steal the show than ex-thief Scott Lang, who put his colorful past behind him to be an astonishing Ant-Man? Then there's the ever-hopeful young Avenger, Nadia Pym - the bold and bright new unstoppable Wasp! They're all waiting for you in awesome artwork that's big on detail - but short on color!